I flight on a trial and error basis. I prefer flight, however if one of my birds becomes obnoxious or gets into trouble they get clipped. I clip my parrotlets because they fly all over the place otherwise, and for those little guys, it can be a hazard because they're just so small. and at such a small size, they can still get a decent amount of lift even when clipped. Vergil, my senegal, is full flight however he doesnt know how to fly. He'd honestly rather walk, run, or climb. We've tried to learn how to fly, different exercises, he doesn't really care for it (lazy like me). If anything he will fly very short distances (the java tree on my coffee table to me sitting on the couch- maybe 2-3 ft). My other one, Louie, fledged at the store he came from and they clipped him there. His wings have not yet fully grown in so we'll see how it goes from there. I'd like to add that i do have a lazy, old, 20 pound cat who is terrified of the birds but i always take that into consideration with my flighting decisions. And, obviously this is not an option with the parrotlets, but if i were to clip my senegals i would do a "partial" clip first- leave them on the longer side as to allow some flight and see how it goes. I think it may have come across in other threads but I am very much against clipping and do consider it to be cruelty/abuse, and I am more than happy that it most likely will be considered to be by law over here by next New Year's Eve. IMHO if you can't keep flighted birds in the house, then don't get a bird. They come with wings and the ability to fly and shouldn't have this taken away. Imagine keeping horses 24/7 in fields to small for them to run, forcing them to walk in small circles all day, and immagine how out of shape that horse would be, wouldn't you think the bird gets out if shape from not flying then? Or having a dogs hind legs amputated because it runs too fast or is able to jump onto the kitchen counter... I mean I've thought a poodle to walk on his front legs only when asked... I'm sure he would manage to get around if I were to remove the hind ones... It would simply stop him from running and jumping. I take pride when people tell me they haven't seen an amazon fly as well as mine when at freefly events. And it's simply a product of frequent flying and allowing him space todo big flights and he has had this opportunity for his whole life. He does maneuvers you usually only see in smaller birds kept in captivity that does not require the same space to learn them. It brings me to tears thinking about my poor galah who will most likely never get to experience the same things due to her previously abusing owners. I can honestly see no good coming from clipping a bird, only negative effects. Please understand that I am not attacking people who clip, and I am not accusing them of being bad people. I used to clip and at the time I was convinced it was the right and responsible thing to do. I know some people still feel that way, and this post is not intended to inflame but rather to state my opinion on the matter. 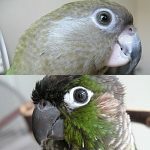 I have two parrots: one is a brown-headed parrot (a rescue) and one is a green cheek conure (a rehome). Both are fully flighted. 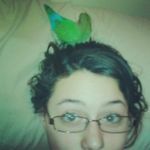 When I was growing up my family had birds (a peach-faced lovebird, a Quaker parrot, and a parrotlet) and we kept all of them clipped. At the time (late 80s - early 2000s) it seemed like the "responsible" thing to do. 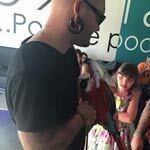 Everyone we had ever encountered in the "bird world" (breeders, vets, other owners) not only kept their birds clipped but encouraged others (including us) to do so as well. Honestly it wasn't until a few years ago that I even discovered, via the internet and forums, that some people purposefully keep their birds flighted and initially I thought, "Wow, how dangerous for the bird." I was curious what the thought process was so I kept reading. Pretty soon my opinion was reversed: it was CLIPPING that was dangerous. The more I thought about it, the more it seemed like keeping a bird flighted was the only way to go. Basically you have an animal whose entire body has evolved for the purpose of flight. Everything from its bones to its muscles to its digestive system to its respiratory system is explicitly designed to be conducive to flight, and yet they are being deprived of this very experience. It's fundamentally wrong, it's against their biological nature, and it's inhumane. I know to some people that seems like an extreme thing to say and I'm certainly not personally attacking anyone here but that's just the way I feel. A bird should be able to fly. Clipping can permanently psychologically change or damage a bird. I know this first-hand because my brown-headed parrot, who is a rescue, had a severe and botched clip when he first came to us. He was an extremely fearful bird who would startle with no apparent provocation and when he was scared he would just fall like a rock to the ground because of his improper clip. This went on for about 6 months until his flight feathers grew in again. Once he was flighted he was much more brave and confident and the random screaming and falling stopped. He still shows the "scars" of being poorly clipped, though. He has been flighted for 4 years now but he is a "fear" biter. When he was young and had that bad clip he learned that "fight or flight" was really just "fight" because "flight" was not an option. When he's scared he just immediately tries to bite out of instinct, and he bites really hard and will draw blood. This is in complete contrast to my GCC who never had a bad clip and for the most part does not bite at all. If he's scared, my GCC just flies away. My Oscar came to me as a previously clipped bird with some attitude problems. I allowed his flight feathers to grow out and started "baby steps" flight training (see Michaels blog on beginning flight training) after I had a couple flight stands made up. At first he was very cautious and basically clumbsy due to years of non-regular flight. With training his confidence and flight ability have improved SIGNIFICANTLY. Even in mid-flight he used to beat his wings loudly and without much coordination to get where he wanted to go. Now he flies like....well a BIRD. I wouldnt say he is a graceful as a bird that was never clipped but he is close. I dont want to debate the issue so this is just my story. At first I wanted Oscar to be able to fly because hes a bird. (sorry but my brain can be simplistic at times) Next I was thinking that exercise is important for all animals, and as such, how much exercise can an unclipped parrot possibly get unless chased around the house and left to flop around/run for minutes on end? (again this is my thought pattern not a dig at clippers). Armed with the previous revelations i began the process. Before i could begin it was apparent that Oscar was DEATHLY afraid of the training perches and to this day i have no idea why the initial fear. As such, I had to positively reinforce the idea that the perches were a good thing (target/reward). With great help from Michaels training blog I got the ball rolling. He went from stepping from perch to perch, to realizing his wings could get him from one to the other over greater distances. I did not push distance too much at first as I could see Oscar needed to build his confidence in flight and landing and this was accomplished through relatively short flights (say 6-7 feet). Fast forward to today (about 7 months) and now he really looks forward to his flight sessions/training. Perches are located 35-40 feet apart and training sessions last 20-30 minutes on average every day. Thats a bunch of flying. To also improve his flight I do what i call "obstacle flight training" by putting obstacles in the flight path so he is forced to mid-flight maneuver around to reach perch for reward. (for those concerned, objects are large/easily seen to avoid injury). Again my simplistic brain told me that birds in the wild dont simply fly in a straight line. In conclusion, the difference in the behaviour of a clipped bird (prior) to unclipped (present) are startling to say the least. Not only is the physicaly appearance/health of the bird appear better, but his confidence and attitude have improved significantly!!!. Would I ever clip Oscar or any other bird that I might every chose to own in the fuure? Based on the above, i would argue anyone who told me to do otherwise. If I had the option to live in a place where I felt safe with having my lovie free-flighted, I would. But as of right now, I do not. He is aware of how to fly and is by no means 'floor-bound' but he does have a few of his flight feathers trimmed to assure that he cannot gain too much speed or height. hnhobu wrote: If I had the option to live in a place where I felt safe with having my lovie free-flighted, I would. But as of right now, I do not. He is aware of how to fly and is by no means 'floor-bound' but he does have a few of his flight feathers trimmed to assure that he cannot gain too much speed or height. Why don't you feel safe having him completely flighted? None of mine have ever been clipped but I have had one that didn't fly, not because she couldn't but because she never got chance to before I got her and being pretty wild she simply didn't want to come out of her cage even though she had opportunity. For 6 years she was scared of everything, no confidence etc but once she started trying to fly she gained confidence so fast and taming exercises are coming along alot faster. I don't think its 100% to do with her ability to fly but I feel that something has changed within her which is alot to do with the flying aspect. We had a few crash landings but they didn't hurt or scare her. The majority of parrot I have had have not been tame but all had a self confidence and the ability to get away if they felt threatened. They all tamed down in under a year, mostly within a few weeks. -flight=lazy humans dont have to fetch the bird to pet it, just train it to come on command! lol. Mostly because of the cats and our balcony door. We live in the city and if Cassette were ever to get out it would a tragedy. However, I've spent a decent amount of time researching in door free-flight and I just feel the need to tell everyone that my husband and I have decided that we are no longer going to cut my little guys wings. When I caught myself thinking that having clipped wings would keep my bird SAFE from other animals (not our cats, but other people's cats or dogs) and I realized how ridiculous that sounded. Not only that, but there is no denying that keeping a birds wings clipped for convenience is nothing short of cruelty. BUT.... if Cassette were to get moody or bity, we would trim him down a bit just to bring him back to earth. But never again will I purposely impair his ability to fly because of my own fears and worries. He is a bird. Having him in a cage is cruel enough. my current two birds (as well as other birds ive had inthe past who are now deceased) have always been flighted. my reasons for keeping them flighted are pretty much the same as those mentioned by others above, especially the health reason. i think the exercise that flight provides is vital to keeping birds healthy, esp. keeping their organs and minds healthy. I think keeping birds flighted keeps them in their full "bird" personality - meaning, they get to be who they are. I think birds express themselves through flight. my birds fly to me when they miss me after doing their own thing in some other corner of the house, and it is very endearing to be doing something, and suddenly find a bird sitting on you. also, i really do believe it makes birds more confident, and more secure in who they are. this means they bite less, and are less moody, less fearful, less temperamental, and have better personalities, because they use their wings to get away from things that are bothering them, and also feel like they are in control of the world - hence they dont have to constantly struggle to control you. i think a lot of clipped birds try to control their owners because they feel helpless in their clipped situation not being able to move around. one MAJOR challenge, however, with having a flighted bird, is what to do if that bird suddenly becomes aggressive. i faced this challenge last summer, when Ringo got spooked out, and suddenly started biting almost viciously out of the blue. he also started doing something a clipped bird wouldnt be able to do: dive bombing from high places and perches and biting our earlobes. i did some research into aggressive behavior and found a lot of sources saying, "if a bird gets aggressive, clip!!" i did not follow this advice because while it would have solved the dive-bombing problem in the short term, it would only have made the fear-based aggression problem worse in the long run. luckily my husband was very supportive of what i wanted for Ringo and was willing to go along with things, and never insisted that i clip. but goodness, the divebombing was pretty rough on both of us for a while until Ringo got better. my reasoning was this: if a bird is biting because it is coping with excessive stress hormones in his bloodstream (thats what Ringo's situation was) and traumatic fearful memories from a spookout, then allowing it to remain flighted would be a means to alleviate both the stress, and the traumatic memories, because it would provide exercise (exercise is good for stress relief) and distraction from the memories (flight is very mentally enriching for birds). thus, it means youre working toward a long term healing. furthermore, i think one of the things that has REALLY helped Ringo come back to normal (he's about 89% normal now - a little high strung but no longer aggressive, and no longer bites or dive bombs) is the sense of confidence and control that flight (especially flight recall exercises ) provides him. I am one to testify to this! I lost an African Grey, whose flight feathers were clipped. The high wind gust carried her off. She was reportedly sighted a few days later struggling to get up enough flight to get over a chain-link fence. We never found her. With that in mind, we are allowing both of our parrots (CAG and BG Macaw) to stay flighted but are overly cautious (if there is such a thing) to prevent escape out of a door. It is harder to allow the macaw to be fully flighted because of the limited room. We got her from a local pet store (very small store who takes very good care of their pets for sale) and she was clipped. It broke my heart to see her so limited in her mobility. Now that she has some ability to fly (from her cage to a spot of her choosing close by) I feel that she will be safer if she falls or gets frightened and takes off only to find that she plummets to the ground with a thud. My dream is have both of them in an outside aviary that is large enough to allow the macaw full lighted excercise when the weather permits. I allow my vet to help with these decisions. She is well informed about the size of our home and other factors that effect our parrots safety. She helps us with most all decisions that relate to their health, safety, and well-being.